In May 1973, I was finishing my first year as a school counselor in a large junior high when a 14-year-old honor roll student came into my office the last week of school and said, “I cannot go home! I can’t live in this all summer! You have to help me!” And then she began to pour out what would be one of the worst cases of sexual abuse that I would hear in my career. Her story has stayed with me and what I remember most vividly is one line she said about her father. 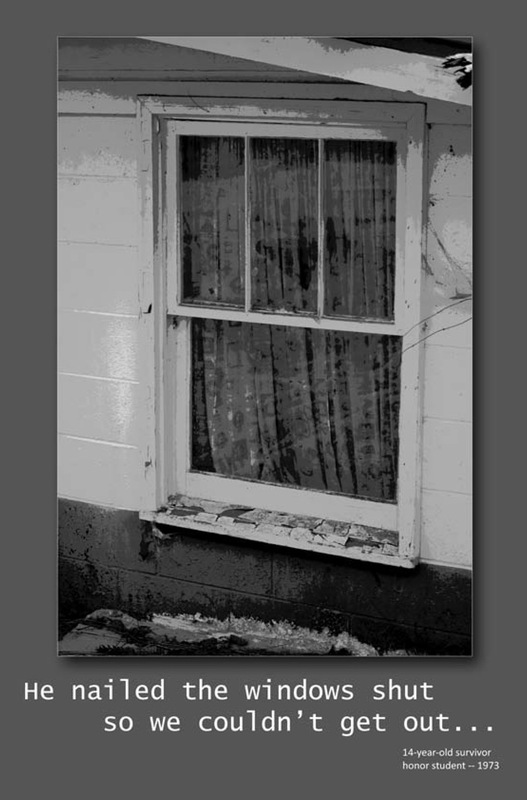 “He nailed the windows shut so we couldn’t get out.” In February 2013, her story would surface again and through a series of synchronicities would lead to this project. The heart of the Finding Voice project is raising awareness about sexual abuse and helping people discover ways to help prevent abuse in their own communities. Over the course of 3 years, I have created 24 story panels. These panels are captured on 24” x 36” canvases. The photographic images for each panel are my work. The story lines that are paired with the photo images were entrusted to me for this project by individual survivors in the hope of opening eyes and raising consciousness. For more than 40 years, I have listened to survivor stories, first as a school counselor and then as a forensic interviewer. Later, as a visiting instructor for Clemson University, I walked my graduate students through their first encounters of reporting and dealing with sexual abuse. Now I listen to the experiences of adult survivors. I don’t find the stories. The stories find me. Many believe that sexual abuse happens “somewhere” but not here. Not in my neighborhood. Not to people I know. The reality is that sexual abuse happens everywhere all the time. No one and nowhere are exempt. Sexual abuse crosses all economic, ethnic, religious and racial lines. The next time you are dining in a restaurant, attending a concert, sitting in a house of worship, participating in a public meeting, walking down the street, having dinner with friends, picking up your children from school remember….one in four or one in six have a story.